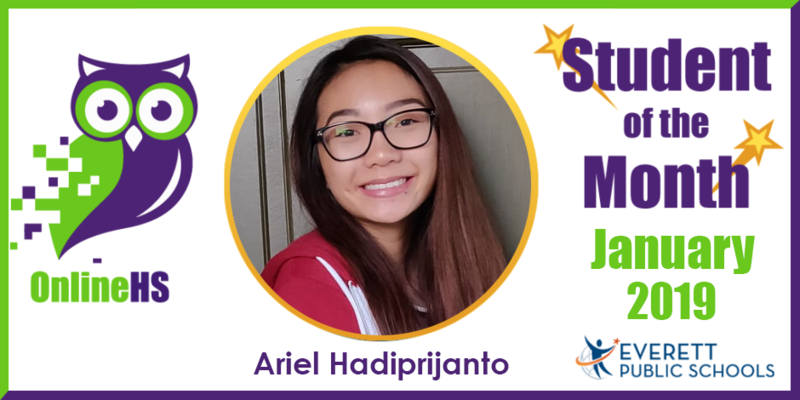 Congratulations to Ariel Hadiprijanto who is our OnlineHS January 2019 Student of the Month. Ariel is a 9th grader at Cascade High School. During the 1st semester, she earned straight A’s while taking 1 AP course as well as 2 Honors courses. In the Spring semester that just started, she is completing the second half of the year-long Algebra II course online. She is an outstanding e-learning student who is self-motivated, a great time manager, and is an advocate for herself. Ariel always goes above and beyond what is expected of her, and that shows in her outstanding mathematics work. After high school, Ariel plans to pursue a career in the film industry. While still a freshman, she intends to find colleges that have degrees in the film industry. One college that interests her is the University of Central Florida. Ariel is not entirely sure which part of the film industry she would like to pursue yet, but she is certain she will find a career in that pathway!